This year, the Eclipse Day in Delft, Netherlands, will focus on tools and techniques to support the software development process, including software maintenance. Visitors of the day will learn how to manage the software development lifecycle with Eclipse-based tooling. The event will take place on 27 September, 2012. Talks will cover techniques and tools helping during tracking bugs and features, code development, quality assurance, and during building and deploying software. The Eclipse Day Delft focuses on interaction and on stimulating discussion between participants. Several excellent talks lasting 30 minutes will inform you about noteworthy and new Eclipse technologies, whereby the discussion rounds throughout the day will allow to get in contact with other participants and speakers. In the late afternoon, demo sessions and drinks will provide plenty of opportunities for networking. The Eclipse Day Delft is a non-profit event. Ticket prices will be calculated to cover the costs of the day, and will include catering. In addition, we offer a limited amount of student tickets allowing free participation. The registration site will open end of July, 2012. To register for this event, click HERE! If you're not able able to register any more please fill in the contact form on the Industrial TSI website, and we'll put you on the waiting list. The call for papers is now CLOSED. The program for the day can be found below. Talks focusing on tools and practices to control the process of tracking bugs and/or new feature requests. Talks informing about version (source) control systems such as SVN or Git. Talks demonstrating best practices and tools to help the developer write code in Eclipse while reducing effort and increasing quality. For example, new or noteworthy techniques such as code generators, annotation processors, JVM, OSGi, and so on. Talks addressing quality assurance. This includes tools and practices to assure and improve code quality (e.g., static analysis), testing tools and practices, as well as continuous integration solutions. Talks about tools and practices that aid in building final deployable products from code. Talks informing about tools and practices facilitating deployment of software during several stages in the software development process (e.g., deploying in test and/or production environments). Talks demonstrating how several tools and practices can be integrated into a holistic software development lifecycle. Talks reporting significant experiences with Eclipse-based tools to support the software development process. Support a great event while making qualified contacts with Dutch and international participants! Silver: Limited to 6. Show your demo’s during breaks and borrel. Gold: Limited to 1. Will be mentioned before lunch by short presentation. 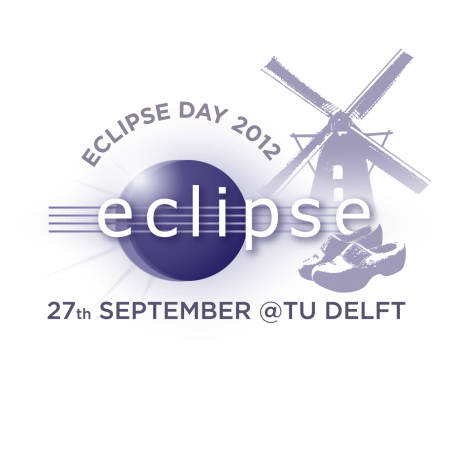 If you want more information about sponsorship of Eclipse Day Delft 2012, please send an email to eclipsedaydelft@gmail.com. This page was last modified 09:14, 5 October 2012 by Michaela Greiler. Based on work by Werner Keil, Yuri and Wim Jongman.